The unique Compact L-Block with Dose Calibrator Shield is designed to maximize space in facilities receiving and preparing doses of high-energy nuclides such as FDG F-18. This unit provides convenient access and viewing of the work area and incorporates a built-in calibration chamber shield. The special shield is designed to accommodate a chamber that is through-mounted in a countertop (customer responsible for installation). The chamber shield accommodates all Atomlab chambers and many others (check chamber shield specifications to determine fit). This combination of L-Block and dose calibrator shield eliminates the need to purchase interlocking shielding rings. This unit is constructed of lead encased in steel. 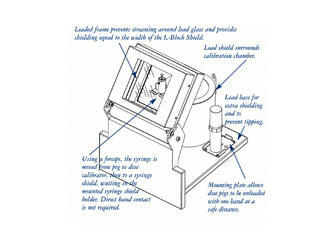 It features a large 8" x 8" x 4" lead glass window with adjustable window angle, 1.5" thickness lead shielding in front, and 1" thick lead in the base and in the chamber shield. A special plate with a hex-shaped recess is mounted on the L-Block base to facilitate one-handed loading and unloading of dose pigs incorporating hex-shaped bottoms. The optional 042-434 Lead Brick Cave fits neatly into the sides of the vertical section to provide lateral shielding around the full perimeter of the L-Block's base. For hot labs in mobile vans, the optional Brick Cave Cover will prevent the cave from shifting when the vehicle is in motion.